2009 saw the introduction of Internet-capable HDTVs and also Internet-capable Blu-ray Players with Wi-Fi. When you look for an HDTV today, one of the first things you notice is how they are designated by screen size. Most HDTVs are 32 inch, 40 inch, 46 inch, 50 inch or larger. But what exactly is this measurement? It is the distance from one corner across to the opposite corner on a diagonal. This is the standard way of designating screen size, a diagonal line across the screen. But is this a true way to measure screen size? Someone who had a traditional analog TV with a 20 inch screen and bought an HDTV with a 40 inch screen would assume that their TV screen just doubled in size. But did it really? Lets take a closer look. Simple math can be used to calculate true screen size for a TV. First a small note to consider. TV screen sizes are not exact. A TV may be designated as a 20 inch when in fact the screen is 20.5 inches across or it could be 19.5 inches, close but not exact. Measure the distance across the bottom of the screen (the screen only, not the TV). This is the width of the screen. Now measure the distance from the bottom of the screen to the top. This is the height of the screen. To calculate the total screen area (total viewing area), multiply the width times the height. For example, if the TV screen measures 16 inches wide and 12 inches high, then the total screen area is 16 times 12 or 192 sq. inches. 192 sq. inches would be typical for an analog TV in the 20 inch size. The screen size of this TV, 16 by 12, says a lot about what is known as aspect ratio. 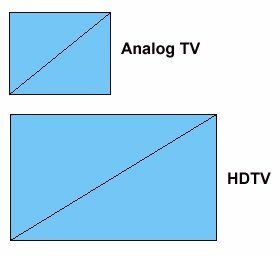 The aspect ratio of traditional analog TV sets is 4:3 or 4 units wide by 3 units high and in our example we can see this is true. 16 inches wide by 12 inches high is a 4 to 3 ratio. (Divide 16 by 4= 4 and divide 12 by 4= 3) or (Divide 16 by 12= 1.33) 4 to 3 is the same as 1.33 to 1. This is how analog TV screens look, like a rectangle but fairly close to a square. HDTV screens on the other hand are much wider than they are high. HDTVs have a 16:9 aspect ratio. 16 units wide by 9 units high. Because HDTVs have this 16 to 9 aspect ratio, comparisons to the old analog TV screens of the 4 to 3 aspect ratio are like comparing apples and oranges. But now lets look at the 40 inch HDTV. Measure the screen width and then measure the screen height. A 40 inch HDTV screen measures roughly 40 inches at the diagonal. We can use math to make sure the calculations are correct. For this example, the HDTV screen will measure 35 inches wide and 19.7 inches high. This should be a 16:9 ratio. 16 to 9 is the same as 1.78 to 1 meaning the HDTV screen is 1.78 times as wide as it is high (divide 16 by 9= 1.78 and divide 9 by 9= 1) or (divide 35 by 19.7= 1.78). Now to calculate total screen area, multiply width times height or 35 times 19.7= 689.5 sq. inches. Much bigger than the 192 sq. inches of the analog TV. In fact the total screen area of the 40 inch HDTV is more than double, yes, more than triple the size of the 20 inch analog TV. That's right, the 40 inch HDTV has a total screen area of 3.59 times larger than the 20 inch analog TV. Applying this to TV screens, anyone can check the validity of screen measurements. By drawing a line diagonal across the TV screen, the screen forms two triangles. The width is "A" and the height is "B" and the diagonal is "C". So if you know the length of the diagonal or if you know the length of the width and height, you can calculate the remaining side. Since HDTVs have a 16:9 aspect ratio, you can check the measurements. In the example above for the 40 inch HDTV: "A" is 35 inches and "B" is 19.7 inches and "C" is roughly 40 inches. "A" becomes 35 times 35 or 1225. "B" becomes 19.7 times 19.7 or 388 and "C", the screen's diagonal size, is stated as roughly 40 times 40 or 1600. Therefore 1225 plus 388 equals 1613. So then the square root of 1613 is 40.16 which would be the exact diagonal measurement. Any simple calculator has the square root key to give you the answer. If you own a 32 inch analog TV and want to get an HDTV with the same screen size, you may be surprised to find out you actually have lost screen viewing area. That's right, an HDTV with a screen size of 32 inches has less screen size than an analog TV of the same screen size. The HDTV has a 16 to 9 aspect ratio and the analog TV has a 4 to 3 aspect ratio. Even though both TVs have the same screen diagonal measurement, the screen area is a little different. Let's calculate this. A 32 inch analog TV screen measures 25.6 inches wide and 19.2 inches high and 32 inches across diagonally. The aspect ratio of 1.33 to 1 (or 4 to 3) is calculated as 25.6 divided by 19.2 which equals 1.33 and the total viewing area is calculated as 25.6 times 19.2 or 491.52 square inches. Checking against the Pythagorean Theorem, 25.6 squared is 655.36 and 19.2 squared is 368.64. Then 32 squared is 1024. 655.36 plus 368.64 equals 1024. Now let's compare the HDTV with a 32 inch screen size. The 32 inch HDTV is 28 inches wide and 15.7 inches high. Therefore the total viewing area is 28 times 15.7 or 439.6 sq. inches. So the 32 inch HDTV has 51.92 sq. inches less viewing area than the 32 inch analog TV! (491.52 minus 439.6) So the HDTV screen is actually 10.6 percent smaller in total viewing area. Therefore when you buy an HDTV to replace your analog TV, and you want to make sure you do not lose screen viewing area, you need to buy an HDTV with a screen size slightly larger than your analog TV. Always round up when close in size. HDTV screen sizes run from 19 inch up to 65 inch and more but typically most sets are in the range of 26, 32, 37, 40, 42, 46, 50, or 55 inches. Anything bigger gets to be too much to handle and weigh too much, particularly with Plasma displays. Organic LED HDTV screens may eventually solve those problems however. So if you have a 27 inch analog TV, get at least a 32 or 40 inch HDTV. Watching 4:3 content on an HDTV (16:9) is not a good match but it can be done. Older video, meaning anything before 1997, on broadcast TV, VHS, Laser Disc etc. was generally 4:3 and showing this on a 16:9 HDTV display results in a mis-match. 4:3 content was designed to be displayed on a 4:3 TV, meaning an analog NTSC TV. When you try to show this older video on an HDTV, certain compromises have to happen. Thus the appearance of the "black bars". The black bars can appear on the top and bottom (letterbox), left and right (pillarbox) or on all four sides at once. Getting the black bars off your screen is usually a compromise and can be done by stretching or expanding across your screen. Depending on how your devices are designed, you should be able to adjust the aspect ratio of the source (DVD player, cable box etc.) and/or the TV in order to change the way the video is displayed. A DVD player for example should have a setting for adjusting the aspect ratio (4:3 - 4:3 pan scan - 16:9) and your TV should have a button on the remote control or in a menu setting to adjust aspect ratio. It may be called focus, video, zoom, picture, setting, full, display or any number of other labels but functionally perform an adjustment so that the video can be expanded to fill the screen. The issue here is picture distortion. This is the compromise. You sacrifice picture quality sometimes in order to get rid of the black bars. Even newer video can produce black bars on a TV if the video content was produced in a wider aspect ratio than 16:9. In some cases, when the video was produced in a widescreen format, wider than 16:9, it may be impossible to completely get rid of the black bars. Sometimes the adjustments seem counter-intuitive but just keep trying combinations until you get what you want. For example a DVD in widescreen format displayed on a 4:3 TV may need the 16:9 setting in the player in order to show up on the TV without black bars. You may have to drill down in the on-screen menus for the DVD player in order to set the aspect ratio. Also make sure the DVD is not playing while making the adjustment. If the DVD was produced in or modified to 4:3 then it will fill the screen of a 4:3 TV. Some DVDs have both 4:3 and 16:9 available. One on a side. Flip the DVD over and you may find the widescreen version. If the DVD cover says the aspect ratio of the movie is 2.35:1 or 2.39:1 then you may have to live with some small black bars as this is very widescreen. If you do not like black bars, try to pick your DVD in a format appropriate for your TV. A non-widescreen DVD would be better for an analog TV. If however you want to see the movie as intended, widescreen is better, but you may have to live with the black bars unless you expand the video, producing some distortion. Total viewing area is 328.13 sq in. Total viewing area is 173.28 sq in. Total viewing area is 438.03 sq in. Total viewing area is 129.2 sq in. Total viewing area is 421.29 sq in. Total viewing area is 124.64 sq in. Total viewing area is 332.01 sq in. Total viewing area is 98.8 sq in. Total viewing area is 511.56 sq in. Total viewing area is 349.92 sq in. Total viewing area is 684.04 sq in. Total viewing area is 261.36 sq in. Total viewing area is 659.61 sq in. Total viewing area is 252.72 sq in. Total viewing area is 520.01 sq in. Total viewing area is 198.72 sq in. Total viewing area is 801.15 sq in. Total viewing area is 491.52 sq in. Total viewing area is 1068.2 sq in. Total viewing area is 368.64 sq in. Total viewing area is 1028.96 sq in. Total viewing area is 353.28 sq in. Total viewing area is 810.96 sq in. Total viewing area is 279.04 sq in. For 4:3 TV displays, the standard for viewing distance is from 3 to 6 times the width of the screen. So if you have a 27 inch screen, you can sit about 7 feet to 13 feet away. But with HDTV, you can sit closer to the TV set because it offers more detail than analog TV. You can actually sit as close as 1.5 times times the screen’s diagonal size. The recommended maximum viewing distance is 2.5 times the screen size. So for a 40 inch HDTV, sit about 5 feet to about 9 feet away. If you feel more comfortable at a greater distance by all means do what you think is best as these are just general guidelines. Both very dark and very bright rooms can cause eye strain over time. Also reflections off the screen caused by local lights, windows or other light sources can cause difficult viewing. How do I hookup my DVD player using component video? How do I setup my DVD player for surround sound? How do I hookup my DVD player with DVI or HDMI connections?